What set the capstone seminar apart from traditional English courses was its focus on student-conceived final products which showcased students’ skills, knowledge and interests. Students received mentoring through one-on-one meetings with Mulready and participated in peer group discussions about their topics of choice. The finished products illuminated both the diversity of student interests as well as the degree to which instruction in English, Creative Writing and other subjects taught students to make persuasive arguments, engage in in-depth research and produce creative works that built upon Mulready’s own scholarship. James Kwapisz doodled through much of Mulready’s seminar. But he wasn’t tuning out his professor; he was practicing for his artful final project. Kwapisz wrote and illustrated a comic novel, entitled Why the Book Should Prevail, which combined the senior seminar’s focus on the materiality of books with his own interests in fiction writing, history and art. The comic novel celebrates the book’s primacy among all other literary forms through the imaginative story of a bullied, time travelling mama’s boy who develops a passion for the written word. The novel’s protagonist, Seymour Maximus, is a nerdy, 1990s teen who falls into a decades-long coma and awakens to a world of Internet and eBooks. A Google search produces a trial version of a Time Travel Do it Yourself CD, which transports him to various epochs in literary history. He mingles with Shakespeare, spies on Johann Guttenberg printing his famous Bible, and nearly gets hung in 1517 for reading the Bible without an intermediary. 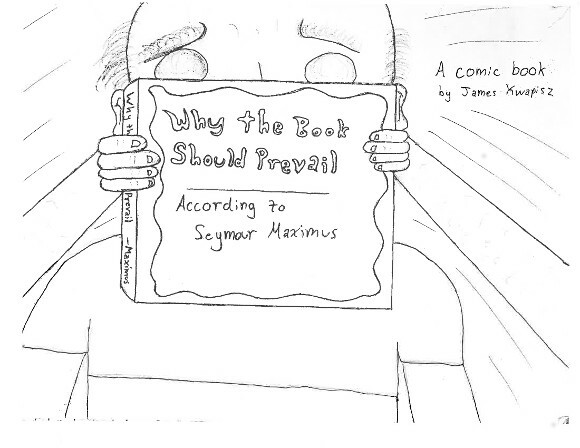 Through his experiences, Maximus becomes an advocate for the written word, believing that reading on computer screens will cause the “devolution of the human mind.” To save the book from total annihilation, he realizes that his only hope is to transmit what he’s learned (and what Mulready’s course taught Kwapisz), by creating a book of his own. The result is Why the Book Should Prevail, and the final panel – an image of Maximus holding the book aloft – mirrors Kwapisz’s cover art. Kwapisz designed his Creative Writing career at New Paltz to learn about the literature that came before him – from Beowulf, onward. His Creative Writing courses taught Kwapisz to further develop his craft, and he learned a valuable lesson from Associate Professor Heinz Fenkl, that the best way to write is to just write, and worry about editing later. “If you write in a staccato fashion, writing then editing, writing then editing, and so on, the editing side of your brain (left brain) will rob the magic from the creative side (ride brain),” Kwapisz noted. English and Public Relations double major Nicole Brinkley brought her enthusiasm for young adult (YA) literature to the course by exploring the topic of YA cover art. In reviewing a sampling of YA novels published in the U.S. from 2011-13, Brinkley found that covers frequently depict active female characters in passive poses and “white wash” characters of color to make books more marketable in a society which values white beauty. To complete her analysis, Brinkley conducted original research analyzing book covers and providing statistics on the preponderance of white, female characters on YA covers. 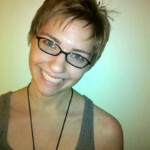 Brinkley learned to frame essays around a question rather than a traditional thesis statement in Assistant Professor Jackie George’s English courses, and refined her opinions about YA covers through her interaction with readers on her YA-themed website, yainterrobang.com. Brinkley, whom Mulready described as a “taste maker,” has blogged YA book reviews since she was 13, and hopes to pursue a career as a book publisher or editor, fields in which she can champion the cause of accurate cover representations. “The important thing for me is accurate representation, even if it doesn’t sell a lot of books right away,” she said. 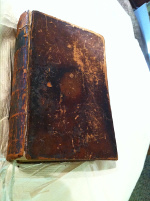 For Emily Drew, a worn, aged Bible housed in the Historic Huguenot Street archives presented an opportunity to undertake original scholarship on one of New Paltz’s founding families. The Jonas N. LeFevre Bible, printed in 1847, contains a genealogical record of several generations of the LeFevre family, along with a wealth of personal artifacts and family photographs stashed between its pages. The LeFevres were Huguenots who came to the village seeking refuge from religious persecution in their home country, Catholic-dominated France. For her capstone project, Drew examined the ways in which the Bible served to record the family’s history and what it said about the role faith played in their day-to-day lives. Drew enhanced her examination into the Bible’s material history with secondary sources that placed the Bible within a historical context. 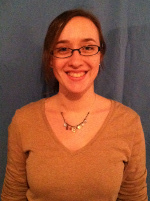 She relied on the Modern Library Association’s International Database and utilized research methods she learned during her undergraduate studies of English. Through her research, Drew concluded that family Bibles, which served as both sacred texts and personal archives, did not signal the printing press’s attack on church authority, as some authors have speculated. She noted that families like the LeFevres still attended church, but their personal Bibles reveal a more complex, private religion that synthesized private study and public, church practice. Drew found the capstone experience rewarding. By the time she was completing revisions, she drew satisfaction from knowing that her paper was largely “original research on a text no one has looked at in this way before,” she said. Her remarks validate Mulready’s mission for the capstone course. “There are very few opportunities for students to do real work,” said Mulready, noting that many courses ask students to replicate ideas scholars have already espoused. The senior seminar asked more from students, and Mulready received more in return. “These are students who are doing real scholarship, real creative work,” he said.